George Zimmerman is releasing a painting portraying Angela Corey, the special prosecutor who charged him with second-degree murder. 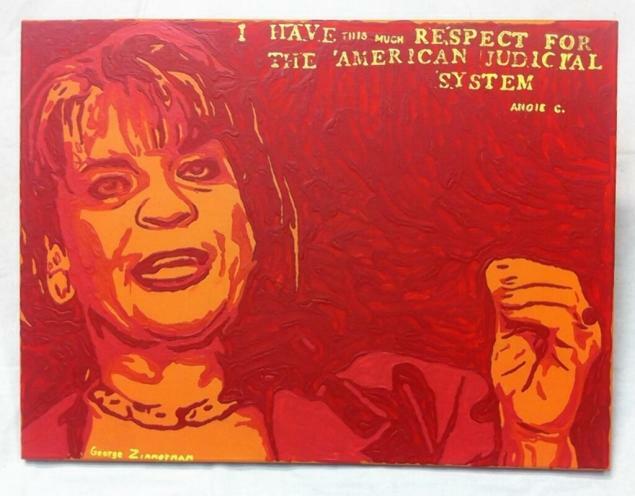 The artwork titled Angie uses shades of red and orange to depict northeast Florida state attorney Angela Corey. Robert Zimmerman Jr. posted his brother’s new painting Wednesday on Twitter. He said details about its sale would follow Thursday. George Zimmerman sold another painting on eBay last month, with a winning bid of $100,099.99. He was acquitted in July in the 2012 shooting death of 17-year-old Trayvon Martin. George Zimmerman’s attorneys successfully argued that he shot Trayvon Martin in self-defense.